In chapter 10 titled, “Jazz Criticism and its Effect on the Music,” Baraka remarks that, “Barbra Streisand is no Aretha Franklin (no one else is either). But that it is Streisand that makes the millions.” Within the chapter on Nina Simone, perhaps the foremost chapter in the book, he declares “at the same time, the Streisand’s, Shores, Ronstadt’s, with less talent, have reaped far more benefits. She (Nina Simone) knows, as does any person really clear about American life, that such injustice is rooted in the racism and class bias of the society’s history and development.” While this might have been a legitimate argument during the 20th century, I would argue that in the 21st century, color does not determine decisions made within the falling music empire. Does today’s music executive care if a rapper is black, anymore than he cares if the female jazz singer is white? Does he care if the musician can play or if the vocalist can sing? Does he really care if the money is black or white? Personal cultural and race prejudices in the 21st century, whatever they might be and they do exist, do not drive a priority over the all-powerful dollar. The more fundamental question should be, why does the public make the choices that they make? What we do know is that the choices are not based upon education since public education on the history of African American culture is nearly non-existent. After all, what is the color make-up of the crowd that attends jazz venues (the few that are left) in the 21st century? Within this same chapter, Baraka states that Hollywood has produced films on the lives of Rocky Graziano and Jake LaMotta but not on the man who beat them who also happens to possibly be the greatest boxer of all time, Sugar Ray Robinson. Moreover, he goes on to mention that there have been films on Benny Goodman, Glen Miller, Janis Joplin, Bix Beiderbecke, Red Nichols, Helen Morgan but where are the films on Miles Davis, Duke Ellington, Count Basie and John Coltrane? But the concerns related to this issue are much greater and convoluted than that. The film footage that has been published on African American musicians has routinely focused its attention on drug and alcohol addictions more so than on the creativity produced by the greatest artists in the history of our country and culture. The most recent being the film, Jazz (2001) produced by Ken Burns. Yes addictions are part of that history but do the adverse aspects have to remain the primary focus of these great African American artists? In chapter 20 titled, “Ritual and Performance,” Baraka states, “We must rejuvenate and reorganize the popular culture of the U.S. by going to the grassroots of creativity and productivity, the masses of the people, of which we are hopefully one of the most sensitive and thoughtful parts. We must create our own theaters, concert venues, magazines, newspapers, journals, publishing houses, art galleries, schools and not merely toll away like drugged monks at the bell of vicious moribund capitalism, called imperialism.” This is a most interesting statement and perhaps an even more critical one when you consider that an African American now resides in the Whitehouse. Let me explain. A number of surveys have recently been considered asking if African Americans are better off today, and whether the issue of racism still exists in America. But the election of Barak Obama creates a new type of challenge for African Americans. In fact, the election of Barak Obama has only helped to create the illusion that racism no longer exists in America and that African Americans’ are now better off today. Sadly but predictably, it hasn’t taken us long to forget about the aftermath of Hurricane Katrina, which is one the most telling and humiliating embarrassments in the history of our country, and one that was largely about race. Why? As mentioned previously, the American public educational system has never incorporated a curriculum that yields to the importance of African American culture in our history. African American youth need to understand the challenges of the past, and most importantly, the inventions and accomplishments of the numerous outstanding African American scholars within science, medicine, and the arts. The names are endless yet one would be hard pressed to find these names within the curriculum of any American grade school system. Now with the election of President Obama, will the African American community still feel the need to stand up and demand change in our public school curriculums, or will they sit back and wait for the president to make the needed changes all by himself? The truth is, there is not a more appropriate time for higher expectations in the support for African American children and the education that they deserve to receive. Why do many African American children today link Martin Luther King with the freeing of slaves? Children should not have to wait to attend a university to learn about the significant accomplishments by African Americans. How can we expect African American children to grow up with a sense of pride and ownership if they are not taught what is theirs to own so that they can build on that history rather than not expecting to have a future at all. It’s not just wrong, it is a crime and it is unjust. Now is the time for new community Black Leaders to step up and demand change in our educational curriculums. Now is the time not to accept “no” for an answer. There are two chapters where Baraka mentions the fact that Down Beat provided no stars in its rating review of records by Monk, Charlie Parker and Dizzy Gillespie. Yes, that was a lack of vision and yes, I’m sure that Downbeat wishes it could turn back the clock, but was it on purpose due to the influence of race? If Down Beat was racist, why would they start a publication on a music that was largely dominated by the genius of African American’s? Does Baraka want to see them fail because of a lack of foresight 70 years ago? Wasn’t it Louis Armstrong that called this new music (Bebop) Chinese music? We recently observed the demise of JazzTimes but fortunately due to outside help and a quick turnaround, it is still alive. Let’s also not forget that particular prominent and progressive African American jazz musicians have been featured within the pages of Down Beat, but have yet to perform at “Jazz at Lincoln Center,” which has an African American as its Artistic Director. I’m not denying that racism exists; I am deploring the author’s unrealistic and unfair shotgun approach. Within part 3 of the book, “Notes, Reviews and Observations” Baraka points out that Peter Brotzmann’s group, “Die Like A Dog” has an emotional content that disconnects style from substance and replaces it with a one-sided, flap snap shot of the form as path, but is unable to conceive of where that path leads. It’s interesting that Baraka should single out Peter Brotzmann for an analysis on the approach of a specific artist. Peter Brotzmann who is from Germany, cannot identify nor express the African American experience anymore than Baraka can understand the pain for an artist from a country responsible for the Jewish Holocaust. Furthermore, two of today’s greatest African American artists in music are Hamid Drake and William Parker who are both in the group Baraka mentioned previously, “Die Like A Dog.” In every instance and in every musical setting that Drake and Parker are a part of, there is a musical imprint within the music that cannot be denied. Based on Baraka’s statement, does this mean that when Hamid Drake and William Parker share music with Brotzmann that they somehow lose their Blackness? But it doesn’t end here. Baraka goes onto say, “When the emotional content of this music is missing, as it is here and from a depressing number of other players of the ‘new music,’ it becomes formalist and academic.” Ironically, that’s exactly the approach of Baraka’s writing, which attempts to dismiss the work of a man who is more sympathetic to the African American experience than most people I have met in my previous 40 years.” What’s more, part of the problem is with those who are more than willing to try and “own” music as if art, a living entity, can be owned and told exactly what it is expected to do. A form of slavery, clearly not yet understood. Within this very same chapter, Baraka proceeds to review the exceptional historic album that Joe McPhee recorded in 1970 titled, Nation Time. Baraka declares, “McPhee is often in danger of being the other pole of what happens to influence without depth, impact without complete understanding of WHY the paradigmatic expression emerged in the first place.” It’s the judgmental attacks on the artist, rather than a review of the music that I find unnecessary and disappointing, and raises questions about the integrity of the book, especially from a writer that has produced such extraordinary work. 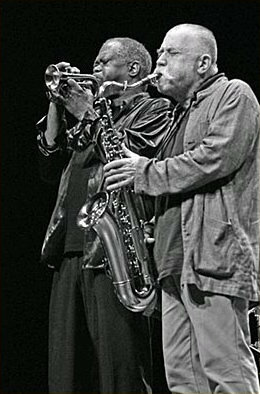 Furthermore, Joe McPhee who is African American has been collaborating with Peter Brotzmann for a number of years, on a number of inspired projects. Is it just a coincidence that Baraka has chosen to review McPhee’s recording within the same chapter as Brotzmann’s? I think not. In the chapter titled, “Cosby and the Music,” Baraka states, “They said, Bob Dylan, he’s really a revolutionary writer—but I think one of the greatest records made then was Marvin Gaye’s What’s Goin On? And that comes right out of jazz. It’s closely related to Miles, Bird, Diz. The sound and the consciousness.” My argument here is that the greatness of Gaye’s music should be celebrated and not compared to any musician or artist. This is the brilliance of both Marvin Gaye and Bob Dylan. Why should their work be diminished by making comparisons, when their genius is in the individual expression and art form that is uniquely their own. How can they, and why should they be compared against each other? Why do some writers continue to take this approach? Baraka goes onto mention that classical music is being represented as “the” music of Beethoven, “the” music of Bach and “the” music of Bartok. But never is Duke’s music, “the” music of Duke Ellington or “the” music of Monk. That would confer a station and dignity on the music that the racist superstructure has never wanted to allow. I find this very bizarre. Every music fan of jazz that I know, regardless of color, loves this music and the people that create it. Are they a part of the racist superstructure as well? If he has specific names, I’ll be the first to ask that he call them out. But to take a full sweep over the heads of those that love, admire and respect these artists is narrow and short sighted. Baraka remarks, …”often it would seem that Jazz and Blues are European and Euro-American inventions. Racist media and anti-scholars are working feverishly on such a klannish historical genocide.” Though racism is alive and well, I still have difficulty with these types of open blanket statements that reflect a type of race related paranoia. Who is it that is trying to diminish or eliminate the names of the greatest African American composers in American history? Who is trying to take away the accomplishments of Louis Armstrong, Charlie Parker, Monk, Dizzy, Ellington, Coltrane, Billie Holiday, Miles, Ben Webster, Al Green, Smokey Robinson, Dexter Gordon, Charles Mingus, Johnny Hodges, Don Cherry, Eric Dolphy, Lee Morgan, Art Blakey, McCoy Tyner, Sonny Rollins, Sarah Vaughan, Charles Lloyd, Coleman Hawkins, Art Tatum, Pharoah Sanders, Max Roach, Ella Fitzgerald, Count Basie, Ahmad Jamal, Freddie Hubbard, Benny Carter, Ray Charles, Lester Young, Tupac Shakur, Jimi Hendrix, Prince, Otis Redding, James Brown, Sly Stone, Robert Johnson, Bessie Smith, Betty Carter, Stevie Wonder, Jackie McLean, Aretha Franklin, Malaih Jackson, Wayne Shorter, Ornette Coleman, Andrew Hill, Cannonball Adderley, Otis Redding, BB King, Buddy Guy, Al Green, Curtis Mayfield and Marvin Gaye? I mean, who are these genociders of the 21st century? What are their names? In chapter 58, Baraka discusses saxophonist, Odean Pope and remarks that, “Pope is a longtime Max Roach stalwart, a daring, resourceful, skilled, and passionate player, but alas, too solid and fundamentally “inside” to get much ink from the “Gee whiz, it don’t even sound like jazz…ain’t that great! ?” school of music insulters, who got regular jobs as buffoons of music commentary.” As Baraka mentions, because little word or airplay is available for musicians such as Pope, they remain largely unknown. There are very few venues and festivals that are available to such brilliant artists who choose to take the risk and step outside the mainstream of what is called jazz. But in today’s world, I would argue that the problem doesn’t have as much to do with race as both white and black musicians have an extremely difficult time finding venues where this innovative and progressive “creative music” is welcome. What the author should consider is that when someone as creative as Odean Pope cannot get a gig at Lincoln Center where the Artistic Director is black, how fair is it to be critical of anybody else? If Albert Ayler was alive today, could he still get a gig at Lincoln Center? Since Cecil Taylor has now been invited (finally), I would venture to say that the answer would probably be yes. But why should 50 years have to pass by in order to get a gig strictly because of name recognition rather than for the brilliant music that is being performed? Shouldn’t that be enough? Fred Anderson who is now 80 years old, is a giant in this music and one of the original members of the AACM (Association for the Advancement of Creative Musicians), yet he hasn’t been invited. How many years of dues does he have to pay? Is anybody listening? What about Roscoe Mitchell, Leo Smith and Anthony Braxton, who is surely one of the greatest composers in the history of music. However, with that being said, I also believe that Lincoln Center has the right to invite who they wish into their performance hall. The problem I have lies in the fact that they receive funding from those that should take more time and initiative to understand the artistic work that is being accomplished by a number of great artists today. There is a total lack of awareness with a responsibility that is still not being taken seriously. In his chapter titled, “Miles Later,” Baraka affirms, “And finally the classic quintet with John Coltrane, Cannonball Adderley, Philly Joe Jones and Paul Chambers attests to this with much power.” I’m sure it’s just an oversight but Miles never had a recording quintet of these musicians together. The first classic quintet did not yet have Cannonball Adderley, but rather the pianist, Red Garland. Adderley would join Miles to form a sextet and then recorded Milestones. After this wonderful recording, Miles removed Red Garland and Philly Joe Jones and replaced them with Jimmy Cobb and Bill Evans. Bill Evans would leave less than a year later and was replaced by Wynton Kelly. Who am I to say what Baraka should or shouldn’t write but it would be educational and beneficial for all if more time was spent on the positive contributions of the great pianists such as Red Garland, Wynton Kelly, McCoy Tyner, Ahmad Jamal, Cecil Taylor and let’s not forget the late great Andrew Hill. In brief, Digging isn’t entirely saturated in bitterness. Braraka reminds us that Monk was Bebop before Bird and Diz, and his chapter on Nina Simone is sentient and heart warming, expressing the beauty and complexity of a brilliant soul. And it is here where Baraka expresses the most beautiful words, transforming them into music while inviting us inside, into the spirit of these giant artists. My intent for this review and discussion was not to diminish the reputation of Mr. Baraka, though it may appear that way to some, but to reveal how deep the scars are within us. To have said nothing was not the answer. We need to stop and at least try to understand our differences and find a way to focus on the positive aspects of each other, and not on the matter that separates us. In the end, I find myself wanting to believe that music can break through the bridge of cultural intolerance; yet Digging only proves how far we yet have to go. And just perhaps, that’s not such a bad omen. Note from the author: I would like to point out that there are a number of various definitions of “racism” and the list is growing. Rather than try to explain all the vast interpretations and definitions, which is not the intent of the paper, I selected one definition to use as a point of reference. Granted, the reader may come from a different reference point. I would also like to thank Barbie-Danielle DeCarlo for sharing her time and thoughts in conversation on this paper and topic. Though we may not agree on the definition of racism and certain related aspects of it, I think we agree that discourse on this topic is of utmost importance. This Music Diary entry brings to a forefront the endless search for a reasonable approach to racism in the music that has been overly labeled and misunderstood. The musicians themselves know the answers to all the questions posed. If only we could lift the errors of history and realize that, in fact, no matter what ethnicity represents musicians, artists, dancers, that difference enriches the culture that whites participate in rather than takes away from it. Thomas Jefferson wrote that “All men are created equal…” but he, himself, owned tens of slaves on four farms. The irreconcilability of this lies, I suppose, in the way he treated his slaves, which was not brutally. He treated them as human beings, gave them humble abodes and responsibility in their duties. Or so has been reported. But some people will never get it.